Sleepsuit Termal 100% Cotton Included in the Pack: Sleepsuit + Pack Seeds / Lavender + Instructions for Use + GIFT (Pack Gel). 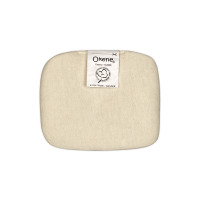 PACK ORGANIC OKENE (Anti-Colic Sleepsuit + Body) Designed to help naturally relieve colic of the baby's infant. OKENE Termal Sleepsuit Included in the Pack: Sleepsuit + Pack Seeds / Lavender + Instructions for Use + GIFT (Pack Gel).